Identity and community are two theoretical terms educators use for theorizing and understanding what happens in classrooms and for designing curriculum. There are, however, serious theoretical difficulties and incongruities in which the two terms are thought, which arise from the underlying ontology of the same. In this article, I propose to think the two terms within a different ontology, one that thinks difference not in terms of its deviation from the same but that thinks difference-in-and-for-itself. This then allows us to understand identity and community as non-self-identical entities that embody change, that is, entities that have change as a constitutive feature. That is, difference-in-and-for-itself leads us to a process ontology that is consistent with past (Bakhtin, Bergson, Husserl) and present (Deleuze, Derrida, Nancy) philosophical approaches to change, evolution, and difference. To concretize my argument, I provide (a) a computer model of collective decision making as an analogy and (b) concrete examples from a second-grade mathematics lesson. 1Identity and community are theoretical terms denoting particular experiences that arise from participation in human, cultural-historically contingent society. Although sociocultural and cultural-historical researchers have drawn on the way these concepts have been formulated within the tradition, they generally have not carried forward the fundamentally dialectical materialist way of thinking that has been central to the efforts of the ancestors of these theories (Hegel, Marx, Vygotsky, Leont’ev). In contrast, some of the recent work concerning the two concepts does in fact use an inherently dialectical approach as exemplified in the introductory quotes. Thus, the first two quotes suggest that one cannot understand identity (“I,” “Self,” the “One”) without understanding the Other; the third quote suggests-in contrast to much of the going literature-that every (community’s) culture inherently is multicultural, that it is different wherever we look, and that it is not a unitary, homogeneous solid defined by periphery and center. In some approaches to dialectics (Hegel but not Marx), Self and Other would be defined as mutual opposites, negatives (negations) of one another-in a Venn diagram, one term would then be on the inside of a circle (A) and the other constitute everything on the outside (¬A or not-A). There are some inherent weaknesses in thinking the concepts of identity and community in terms of opposites and oppositions, inside and outside, newcomer and old-timer. 2In this article, I take a different route to theorizing identity and community by starting with a different ontology, one that articulates the processes, flow, and development of community and identity and therefore their historicity and contingency. Rather than opposing the Other and the Self as self-identical contraries, philosophers of difference show how the Self has to be understood as inherently Other, not as its negative but other as a central aspect of its constitution. Rather than understanding culture (or any other aspect of human life for that matter) as one (the “One” in the quote from Derrida) I understand it as a plural singular. Self and Other, who are part of and constitute community, are implicated in one another, inseparably a One and a Many, simultaneously singular and plural in nature ; and culture always is non-self-identical and thus heterogeneous, always is a mêlée of cultures brushing up against one another. Culture always is other than itself and, therefore in a strong sense, is not. Here I articulate a position with respect to community and identity that does not treat these concepts and the phenomena that they denote as self-identical but as different from themselves. I take each concept (phenomenon) to be a process of “heterogenesis, that is, an ordering of its moments by zones of neighborhood” (Deleuze & Guattari, 1991/2005, p. 26, my translation), where its constitution of “moments” means that it cannot ever be a unitary entity but always constitutes a difference at heart. This difference at the heart of the word and the theoretical power deriving from it have already been articulated in the statement that “it is precisely the internal dialogism of the word, which does not assume any external dialogism of the word... that has so much power to shape style” (Bakhtin, 1981, p. 279, my emphasis). This difference within the object and word then allows me to better theorize and model the kinds of communities and identities that we actually observe, always contradictory, always singular and plural simultaneously, always reproducing themselves differently in a process of eternal return, embodying difference at the very heart of identity. But how can we think of difference in and for itself, especially as it leads to the non-self-identity of the Self ? In the following, I provide an analogy that shows how we can think the individual and the collective so that they no longer exist for themselves but always implicate the other, that is, always imply a plural singular. I then provide an example from a second-grade mathematics lesson exhibiting the heterogeneity and hybridity of individuals and the collective they constitute consistent with the analogy and the three quotes that begin this chapter. 3As an alternative to existing approaches, I have adopted into my theoretical repertoire the concept of difference-in-and-for-itself or, alternatively, of the singular plural (Nancy, 2000), which embodies difference and otherness at the heart of identity (which therefore cannot be identical to itself). And because the future-not-yet is part of Self and community, neither phenomenon is but always also constitutes the future-to-come (à-venir). Accordingly, any singularity (Self, Other, community) is what it is only in and through its relation to all other singularities including itself (self-relation), that is, in relation to the plurality. The plurality, as such, itself is a singularity, constituted by the multiplicity of existing singularities. 4To make this concept of the singular plural more concrete, I use the case of constraint satisfaction networks, which has been employed in the literature to model decision-making in complex social situations (e.g., Hutchins, 1995). In its concreteness, the case simplifies things, but dangerously so if it is taken-as-such. I am using it as an entry point for my readers to bootstrap my paper into its argument– so that the bootstrap itself constitutes a beginning before the beginning. 5A network (“community”) consists of some number of “singularities” (persons, here n = 6) ; the value (identity) of any node at state t+1 depends on the values of all nodes, including itself, at state t (Figure 1a)1. That is, no node is stable, and the value of a node in the next instance cannot be taken from the node itself (with a self-relation of 1 or some other value, which would mean, it is not reproduced identically) or from the ensemble of nodes. (Matrices that are asymmetrical model “power relations,” that is, for which the influence of S1 on S2 is different from the relation of S2 on S1, that is, a12 ≠ a21.) Given one or more reference points-e.g., the states where the nodes all have either value 0 or 1-any state of the network can be given in terms of its distance from the reference point. As soon as one new node is added, the configuration as a whole changes (Figure 1b) because of the additional relations that define the ensemble2. Figure 1. An example for thinking the singular plural and difference in and for itself. 6Because the network undergoes continual change unless trapped in one of the extreme positions, no individual node ever is, in the same way that a photograph never is the living person : each state constitutes a snapshot of a process and stands in the same precarious relation to what it is (its being) in the same way that a photograph stands in relation to the person (when a person says looking at a photograph of herself, “I don’t like it, this is not me”). This situation is not improved when we animate the states like a movie animates still pictures, which return to their still states as soon as one stops the reel. Such an animation always comes from the outside and does not present or reflect the internal forces that change the system from within itself. We therefore have to think the nodes in terms of their movement from t to t+1 : They only are in and through this movement, that is, in terms of their becoming. Such a network therefore never is characterized by the values its nodes take at a particular point in time but only how it behaves under given conditions. All of this also leads us to a situation where the relation of any node (member) of the network is a relation to all other nodes (members), that is, in the final instance therefore, a relation of the network to itself. The unity of this network (community) as a whole therefore is that of a self-relation of a plurality of members. In this network, therefore, all the members are equal despite their differences. 7Networks (“communities”) such as the one described exhibit interesting behaviors even in the symmetrical case of mutual influence (aij = aji) and even in the case that the aij are held constant. Let us think of a small community of practice (n = 6)-such as the committees making funding decisions-in which there is a positive reinforcing influence between the practices/identities among individuals 1–3 and 4–6 and a negative influence (e.g., “critique”) between the members of the first and second group. Figure 2 provides five different trajectories of the system as a function of different starting points where the community defining practice(s) has (have) are yet to be developed. These trajectories cannot be given in closed mathematical form, as they are sensitive to variations in initial conditions-set random in the present modeling exercise-and to minor disturbances along the trajectory (not modeled here). Figure 2. 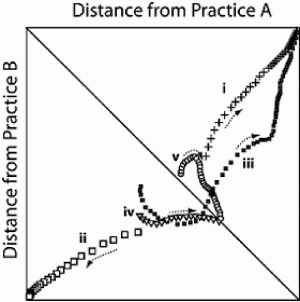 Trajectories of a community toward more stable practices A (ii), B (i, iii), or the co-presence of practices A and B (iv, v). 8Cases (i) and (ii) are the ones with histories that one might expect, where the community with initial inclinations for practices B and A ends up with these practices as steady states. However, the three other cases are the more interesting ones in this simple simulation. Thus, trajectory (iii) is that of the community, beginning with a greater inclination for practice A, nevertheless ends with practice B as the steady state (its end state is far away from practice A) and this despite an initial movement away from its final practice. Trajectories (iv) and (v) correspond to communities that begin with greater inclinations for A and B but end up with a final state where both practices are maintained simultaneously, that is, there is not one but there are two defining practices within the community. It can easily be seen that despite beginning near each other, trajectories ii, iii, and iv lead to very different end states in the development of the community. 9The trajectories in Figure 2 are but representations of the trajectory of the system (in distance space relative to two fixed points) as a whole, constituted by the plurality of individuals and their relations, each of which also is on an individual trajectory. During the entire trajectory, each node is in continual transition (mathematically, the value) and so is the collection of nodes as a whole : the network therefore is better characterized by its tendencies rather than by its states, which already embody and are constituted by the possibilities for the next states, that is, their own and collective future-not-yet. The value of each node (i.e., its “identity) is a (non-linear) function of the node collective, which exists only in as far as it is concretely realized in the individual nodes. Therefore, both taken individually and collectively, the nodes exhibit singularity and plurality. 10In my current thinking, this approach constitutes an interesting model for the transformation of a class of students, such as the second-grade mathematics class that I use as a case in point below. Because of their mutually constitutive nature, individuals and collective are thought together ; and any beginning implicates the future-not-yet that each individual for him/herself and the collective as a whole achieves. Thus, the mathematical nature of second-grade students’ classification efforts, as I show in the next section, already is prefigured as a possibility alongside the non-mathematical classifications they begin with. The individual trajectories are not relative to some fixed community, but each individual trajectory is constitutive of the collective trajectory, which reduces the theoretical usefulness of notions such as “from periphery to center” as used in much of the research on “communities of practice.” There is no one center or margin that is privileged inherently, for any center and any margin is constructed as such by drawing arbitrary boundaries in an open space of continual becoming. Rather, there are as many centers as there are observers and constitutive members, each positioned, each dispositioned, each associated with suppositions and presuppositions. The truth, then, lies in the multiplicity of the phenomenon, here both individual and community, neither of which can be reduced to the other and neither of which has a self-identical core (e.g., the “old-timers” who characterize the core in Situated Learning). 11These trajectories suggest that we end up with different communities of practice-when viewed as a self-identical system-depending on minor variations in initial conditions and along the trajectories. In fact, there is no one community of practice but a continually changing plurality of ever changing practices-the heteroglossia found on the lower socio-ideological levels “on the stages of local fairs and at buffoon spectacles” (Bakhtin, 1981, p. 273). For Bakhtin, in an interesting reversal of social change, the heteroglossia of the “lower socio-ideological levels” is the driver of linguistic and cultural changes, including the ones observed in “high” literature (Bakhtin, 1986). In my example, minor variations of the parameters relating any two nodes also change the historical trajectory of the system as a whole and that of each individual. To make the model more complex and fitting the complexity of the modeled phenomenon, we may add an external influence, for example, modeling the teacher, which tends to constrain the system to move more toward one rather than another final state-even though this cannot be deterministically ascertained unless the model contains unreasonable parameters. 13This form of memory is internal in systems such as the one I model here ; it is internal to the communities that we have come to know about by reading Situated Learning ; and it is internal to the French village school of Moussac, where individual students and the teacher do not have to think about what the practice looked liked last year or the year before, but where the structure reproduces itself and changes in every action (Roth & Lee, 2006). But this form of memory disappears in normal classrooms, which are constituted at the beginning of the year for this or that administrative decision and which are disassembled, reconstituted, and assigned to new teachers at the transition points between the end of one school year and the beginning of the next. 14The relationship between individual (Self) and collective (Self, Other) as well as the relationship between cultures and their concrete practices are central to sociocultural and cultural-historical approaches to understanding human (societally motivated) activities3. Yet there are problems and logical contradictions in research using these theoretical frameworks4. Here I present a way to realize the Hegel–Marx–Vygotsky–Leont’ev program of understanding the subject of activity and, correlatively, of understanding the (the culture of the) community with which individuals stand in an irreducible, because mutually constitutive relationship. In my way of understanding, as shown in the relations that constitute a constraint satisfaction network, each singular entity (concept) is understood as a multiplicity, a plurality, and therefore bears at its very heart an inner contradiction that eschews all reduction of cognition to the individual or to the collective (community)5. But each plurality also constitutes a singularity. 15Much recent work on identity and activity has shown how participation in activity constitutes identity as much as identity constitutes a resource for participating in activity and therefore constitutes a resource for knowing and learning (e.g., Holland et al., 1998 ; Holland & Lave, 2001). Although sociocultural and cultural-historical activity theories radically depart from other psychological approaches in their conception of identity and community, many if not most (Western) researchers drawing on these and related theoretical frameworks share with the latter a fundamental starting point : the ontological commitment to the Same. Thus, for example, community (of practice) is taken as a unitary, self-identical entity (being) that defines membership, level of competence (where an individual finds him-/herself along the trajectory from periphery to core participation) ; in this way, the heterogeneity at the very heart of community as phenomenon and theoretical term only exists as difference along a scale (e.g., newcomer to old-timer, periphery to core), which is not a difference at all (Hegel, 1806/1977). The problem with an ontology of the Same is that it defines difference as deviation from a self-identical entity, which inherently leads to the Kantian position of the power of knowledge that determines the conditions of possibility, representationalism (knowledge in the head), the isolation of the self from its societal and material context, and to the grounding of identity in intentionality and consciousness of self (Deleuze, 1968/1994). Invariably, for example, researchers pledge allegiance to Lev Vygotsky and then theorize learning as a movement of publicly constructed knowledge into the person in a process of internalization. Here inside and outside the person (individual, psychology) are opposites and learning is conceived of as the movement of something from the Other on the outside (interpsychological plane) to the Self on the inside (intrapsychological plane, community and culture). 17The authors of Situated Learning go on to discuss the anthropological tradition of articulating this contradiction between continuity and renewal of a community, which is integral to learning. They state that this contradiction is “fundamental-a basic contradiction of social reproduction, transformation, and change” (p. 114). This particular contradiction arises only for researchers who frame the problem in terms of communities and participants that are self-identical rather than heterogeneous processes in and of flux (durée). Continuity (in flux) and inherent displacement go together without contradiction (Bergson, 1907/1969). Despite its good intentions, there are many other passages in Situated Learning that foster readings that militate against an appropriate understanding and theory of community and, correlatively, of identity, person, and Self. 22An ontology of difference presupposes entities to be non-self-identical with themselves, inherently in flux between past achievements and future-not-yet. 23Recently a mathematics education colleague (Jennifer Thom) and I have begun a project on the role of the body in the learning of mathematical concepts. Locating cognition in the body comes with the potential danger of overly psychologizing mathematics (an essentially constructivist position) by failing to pay heed to constitutive relations that bind individual and collective. For me, the fundamental question of this research is how mathematics comes to be reproduced all the while recognizing that in the singularity of children’s productive actions, it never is identically repeated. As I am pondering attendant theoretical issues, I come to think of repetition and difference in mathematical practices in a new way, especially as these pertain to the questions of community and identity. Here, I use one particular sorting task from the curricular unit as a concrete situation as a basis for my discussion of attendant issues. By means of this and other tasks, children are to be introduced to geometry ; in fact, by bringing about a particular kind of sorting, the children are said to have learned (a little bit of) geometry. In other words, by producing the categorization of all mystery objects, the children reproduce geometry as a field and their actions can be recognized within the general semantic and practical fields characterized by the adjective geometrical. How can children’s productions be geometrical if the children do not think geometrically at the beginning of the lesson ? The answer is that problem lies not with the children but in the framing of learning in terms of states-much like Zeno’s problem is one of framing motion in terms of successive states7. That is, if we consider children and community as hybrids of the immediate past and the (from emergence resulting) future-not-yet, then there is no contradiction between the novel production that each act constitutes and the reproduction of culture : the two are not independent processes but one. That is, in acting, children change and they do so independently of the question of whether they had placed their object within an existing ([non-] empty) collection in a legitimate way8. They change, and with it changes their collectivity, in and through the act of placing the object wherever this may be, because their acts and associated results give rise to new transactional possibilities that subsequently are realized within the collective. 24The sorting task that constituted the first and introductory lesson of the curriculum unit required the participating second-grade students to pull a “mystery object” from a black plastic bag and then place it with an existing group (collection, category) of objects or create a new group (Figure 3)9. To start the task, the teacher has pulled an object, has placed it on a colored sheet, and thereby has begun a first group. Each of the 22 children in the class has its turn to pull and place/sort an object. At the end of the lesson, all 22 students have placed their objects. But in every single case, students do not initially articulate a rationale for the placement (grouping) of their object. The teacher then invites them to articulate their thinking, that is, to produce predicates that explain why they have placed their object in a particular group (“Now can you tell us what you are thinking ?” “Explain your thinking !” “You have to tell us why !” “Before going on, explain your thinking !” “Don’t go away, tell us why you put it there ?”). Figure 3. A moment in the “sort-the-mystery-object” task, where each child gets a turn in sorting an initially unknown object by placing it, as shown on an occupied or unoccupied colored sheet, each representing a (named) collection of like objects. 25As part of articulating similarities and differences, the present students hold their mystery objects next to others providing explanations such as “this is the closest object to it” or running their fingers across the mystery and comparison objects, running fingers along edges and corners and naming them as such, articulating roundness or noting the absence of sides (sphere). In the end, the children-in, through, and mediated by transactions with the teachers-produce a classification consistent with geometrical properties as these have emerged in the history of geometry. That is, as an outcome of their situated work and mediated by the teacher, the children collectively reproduced geometry as a science. (Figure 3 shows the situation near the end of the collective sorting episode.) Although this is a first lesson, the children’s actions, grounded in their everyday experience of the world, have become geometrical in and by re/producing geometry in a recognizable way-though also in ways characteristically different from what adult geometers might have done. In terms of the analogy provided earlier, the classroom collective, consisting of the singular actions of students, ended up in one of the reference states (Figure 2, trajectories i or ii). 26Throughout the lesson, the teacher also reiterates other utterances that adults can hear as instructions : “Just take the first one you feel !” or “The first one you feel !” The sorting activity began with the teacher’s articulation of the rules relating to color and size. In the course of this part of the lesson, many children use size to articulate similarities and differences between objects, followed, when applicable by the teacher’s reiteration of the rules. As a result of the teacher contributions, the sorting session comes to be orchestrated, the teachers being in the conductor position, stating, restating, and reiterating instructions and rules. But this is the orchestration of a partially improvised session, because only the teacher knows the score and the children attempt to play such that it comes to be consistent with the score that they do not know at the time. If the teacher does not restate and reiterate a rule or instruction, the ongoing or immediately past act of classification and predication can be seen and heard as consistent with the (from the children hidden, yet to-be-discovered) rules and instructions. It is seen and heard as a successful action so that now the rules and instructions are descriptions of what has happened. After the fact, the rules and instructions may be said to have led to the successful classificatory act. We can therefore understand the teacher as the additional node in Figure 1b, which, in its interaction with all the nodes, radically changes the collective as a whole, constituting a force that pulls the system (community) toward a desired endpoint of the trajectory (standard geometry as reference point for the community). But we still need to think the children as individual actors so that the lesson could have turned out otherwise as well (e.g., in the way it does in lessons that mathematics educators take as occasions for complaining that elementary teachers lack mathematical knowledge to teach better lessons). 27At the end of the lesson, geometry (as praxis rather than as body of knowledge) emerges from the sorting task. The children, as members to the organized arrangements of this mathematics classroom are deciding, recognizing, and making evident the rational, coherent, chosen, planful, effective, methodical, and knowledgeable character of their inquiries as sorting, classifying, providing reasons, and so on. What is at issue for me in the present case is the role of identity and community with respect to geometry-in-the-making rather than to its ready-made counterpart that appears in books because across time, geometry, as an ideal object, can exist only in and through a second layer, the sensually embodied practices that localize and temporalize (e.g., Euclidean) geometry as non-local and non-temporal ideality (Husserl, 1939). Even though it could not be predicted from the children’s actions prior to the unit (their practices were somewhere in the middle of Figure 2), standard geometry (one categorization practice associated with a corner point in Figure 2) emerged in and through their actions and the corrective feedback (constraints) provided through the teacher’s utterances. Theorizing community-in-the-making means that we have to include the future-not-yet, that which can unpredictably emerge from the current conditions as the ground and material. If we do not do so, no community of geometry would have come off the ground of the utterly non-geometrical thinking that existed prior to its emergence (prior to Euclid and other early geometers). More so, at the very moment the first geometrical theorems emerge, they are intelligible generally, which means, they have had to realize possibilities that already pre-existed. 28Community then can be thought here in two ways. On the one hand, there is the particular classroom where participants have something in common (Lat. communis), thereby constituting something that can be called community. On the other hand, there are and have been people doing similar kinds of things in the past and present, sorting geometrically, so that these students and their teacher have something in common with a community of geometers. The production and reproduction of geometry occurs with respect to the latter, whereas the former is more of a collection of individual brought together for administrative purposes. 10 An extended analysis of this lesson can be found in Roth and Thom, in press. 29The community of geometers is important to the school subject because the objective nature of geometry exists in and through the emergence of geometry in the practical (material) actions of real, embodied, sensual human beings. Standard geometry emerges although no action has to be identical to any other action produced. It is in its contingent production that geometry as objective science can be reproduced across generations, thereby producing and reproducing a geometry community broadly conceived, one that includes society as a whole. It is not therefore that this (or, for that matter, any) geometry lesson causes students to do certain things ; nor is it that in their actions, students produce geometry anew. Rather, the ideal and material nature of geometry as objective science emerges each time when a “member” produces and thereby reproduces practices that recognizably are both different and the same and therefore collectively geometrical in nature. Geometry emerges because it is part of the collectively (societally) possible way of acting in the present-day culture10. 30But for the community to be able to change because of internal reasons and mechnisms, its new state in the future-to-come (à-venir) already has to be implicated in the current state. In fact, community thereby always comes to be other than itself, in continual suspension of being what it is and what it is not (yet). Community-in-the-making then is a process that simultaneously embodies the different states at t and t+1, which are but two sides of the same coin and where state t+1 may be an emergent one unpredictable from what is the case at t. Community-in-the-making includes the possibilities of a future-not-yet, where I do not mean possibility in a metaphysical (Kantian) sense as logical possibility, derivable and foreseeable from current knowledge, but in a phenomenological sense, that which is phenomenally possible in excess over the calculable and explainable in terms of causes and present conditions. Readers will be familiar with phenomena denoted by the concept of emergence : here, too, future states of a system cannot be predicted from the current state. (A popular example exists in Bénard convection cells where molecules in a disorganized state line themselves up to move in hexagonal convection cells when the external conditions are appropriate.) If the children could have completed the sorting task without intervention based on what they knew and could deduce from this knowledge, they (at least some of them) likely would have done so consistent with classical geometry. 31Taking this route then allows me to understand how geometry can emerge from everyday, completely non-geometrical practices : the non-geometrical from which geometry emerges constitutes an essential part of it, for the former constitutes the very ground on which geometry has culturally historically emerged and continues to emerge on the ontogenetic level with each child. The production and reproduction of society therefore also is at the heart of geometrical practice, including all those parts that currently are not recognized as constitutive of geometry. As members of society, children appropriate-and already have appropriated and available-many of the resources that are presupposed and required for doing geometry, which in fact constitute the very grounds and conditions for acting geometrically. Thus, these children competently classify objects-though often according to color and size, which is against the rule of the (language) game they are to learn in this lesson. 32We may take the events described here to constitute an instance of a mathematics classroom where the teacher endeavors to establish certain practices to promote changes along specific hypothetical learning trajectories (Cobb, McClain, & Gravemeijer, 2003). But it also is the case that the teacher does a lot of work, which in other instances may be done by the community itself and without any or little teacher involvement in the planning of the curriculum (Roth & Lee, 2006). In the former case, the teacher is responsible for the reproduction of culture from year to year, whereas in the latter case, there is a memory in the structure of the community itself. Such structural memory has been observed in the one-room school and village of Moussac (Poitou, France) community that Roth and Lee describe, which has reproduced itself and changed over a 20-year period with little direct teaching (Collot, 2002). Because each year the three or four oldest students (after the equivalent of grade 6) left and about the same number of kindergarten-aged students joined, there existed a collective history and memory of established, but ever-changing practices in which newcomers to the school participated and which they contributed to transforming. Once established-this was the most difficult of Collot’s tasks-the community produced and reproduced itself. This was so even after he left and the school and village continued to produce and reproduce themselves with the new teacher of the school. 34Such structural memory is the very presupposition on which a science such as geometry-and the community that keeps it alive-persists. Thus, central to persistence of geometry is the necessity of a structural nature that makes possible the everlasting mobility of a continual expansion in a horizon of geometric futures (Husserl, 1939). The community of geometers is not reproduced by means of handing down and appropriating of certain practices, but a continual synthesis in which the totality of prior achievements constitute the premise for future reproduction and development. However, this totality of some future state could not have been evident at its beginning. Even though geometry has been invented and practiced by individuals it nevertheless has a dimension that from the very first moment on has been independent of the subject (i.e., cultural) and curiously atemporal. This is characteristic of any scientific culture. But it tends not to be characteristic of school classrooms, which generally lack future effects after having been disassembled at the end of the year to be reconfigured anew in the subsequent school year. 35In the context of the global development, in fact constituting it in and through their actions, students not only change what they do (how they sort, how they articulate their rationales) but in the process exhibit and change who they are, that is, (part of) their mathematics (geometry)-related identities. The changes in the classroom as a whole cannot be theorized independent of the changes at the individual level that constitute them. In the present, some students complete the task to the teacher’s satisfaction but others are asked to reconsider their classification and are encouraged to continue until they have placed their object consistent with a sort according to geometrical (shape) rather than other properties (color, size). Connor, characterized by the teacher as “weak in mathematics,” is one of the latter students. After pulling his mystery object from the black plastic bag-which geometrically knowledgeable observers recognize as cube-he creates a new category rather than placing it with the existing set of cubical objects. The teacher first requests a rationale, which he answers by stating that his object is bigger than others. The teacher initially restates the rules for the task (no sorting according to size or color), then encourages him to reconsider and compare his object with all the others, and eventually guides the student to place the object with the other cubes. The following exchange ensues. 62 T: do you think it does? 64 C: like what do you mean? 66 T: ‘does it match. We said THAT this group ((points)) was ‘squa::re (0.31) or cube (0.49) ((looks at Colby, nods)) does it match that? 36When the teacher speaks to Connor, she in fact presupposes his understanding even though the very lesson is designed to “teach him something he does not yet know.” Whatever is new to Connor in the teacher’s talk nevertheless has to be intelligible to him and therefore already has to be prefigured as possibility in Connor’s exhibited understanding. Teaching would make little sense unless what is not yet known already is presupposed as possibility and exhibited in a forthcoming (discursive, manipulative) action. More so, because identity is tied to (others’ interpretation of) exhibited actions, it includes both what currently is and what currently is not yet-acting in accordance with the rules of formal geometry. Connor therefore also is, what he is not yet but can be, that is, other than himself even though we may not be able to predict precisely on the basis of his current knowledgeability whathis knowledgeability will be at any subsequent instant. (Cultural-historical activity theorists know about such contradictions, which are inherent in the object of activity, which includes both current states and materials and a vision of the future-to-come.) Actions, knowledgeability, and identity that an individual student exhibits therefore cannot be so new, because they already exist as possibilities in his current actions, knowledge, and identity (practice). At the very moment Connor exhibits the desired actions for a first time, and therefore exhibits a certain form of knowledge and identity, it also is the knowledge and identity from the other-they already are recognized and exist as possibilities in the culture generally-and it is knowledge and identity for the other, the recipient, his classmates, teacher, and society (which he reproduces in his Being). At the very heart of Connor’s actions, expressions of his Self, we also find the Other, who is at the origin of the possibilities, the source, and recipient. That is, much like the nodes in my network example (Figure 1), we cannot understand Connor independent of the classroom and culture as a whole as he already exhibits knowledgeabilities that are those of the others that have come from the other and, in his actions, return to the other. Current models of identity do not include what a person is not and therefore can theorize identity, and with it, community, only in terms of still images. A dynamic theory of identity, however, also needs to theorize what Connor can be in any next instant, including those facets that are emergent and in excess over the present. Theorizing in this way leads us to a concept of identity-in-the-making, of which identity always only is like a photograph in relation to the continuous unfolding of life that we experience and for which there never exists time out. 37In the present situation, Connor “challenges” the assumption about his competence by asking the teacher what she means ; or rather, his utterance becomes part of a question–answer pair as the teacher utters “‘does it match ? We said that this group was square or cube does it match that ?” (turn 66). We can hear this as an elaboration of her earlier utterance concerning the match between Connor’s mystery object and the criteria/name of the group where he placed it (turn 58). Learning and becoming therefore mean that the individual already is –if we can be anything at all –what s/he is not yet. And this is central to the recent formulation of the nature of Self : “Self is precisely without return to self ; self does not become what it already is : becoming is being outside of self –but such that this outside, this ex-position, is the very being of the subject” (Nancy, 2002, p. 57). 38In understanding the question as question, the teacher acknowledges the intelligibility of what Connor says, even though she might not agree with it and even though she might not understand what the trouble in understanding is. But in using (speaking or hearing) the English language, she presupposes the intelligibility of the said and Connor’s understanding thereof. The (generalized) Other, here concretized in and by Connor, is implicated in the very articulation of her Self (as teacher) in the same way that the value of each node in my network example (Figure 1) implicates the values of all other nodes. Similarly, Connor’s utterances cannot be understood as something that is singularly his own, an expression of his subjectivity and singularity. Thus, when he utters “what do you mean ?” he has to presuppose not only the intelligibility of each word of this utterance but also, aided by the prosody, the hearing of the utterance as a question. Presupposing the intelligibility of the utterance means that his production is but one concrete realization that presupposes another concrete realization by the hearer, here the teacher. This is but an external manifestation of the internal dialogicity-i.e., non-self-identity-characteristic of the word as such (Bakhtin, 1981). Connor produces what we hear as a question for the other, drawing on language that has come to him from the Other, and which therefore, in and through the utterance, returns to the other. It is the Other, says Deleuze in my introductory quote, which functions as a center of enwinding, envelopment, and implication. In its very singularity, Connor’s utterance produces and reproduces a cultural possibility collectively available to many, that is, he reproduces the general (universal) as such. Mathematical understanding generally and participating in mathematical communicative exchanges more specifically fundamentally acknowledge community all the while individuals realize them concretely so that we always require a genetic phenomenological approach to understand understanding (Roth, Bowen, & Masciotra, 2002). Here, both speakers realize the cultural possibility of this form of understanding (of this topic). 39In their utterances, Connor and his teacher presuppose the intelligibility of what they say. But there is contradiction apparent in the situation : the teacher assumes the intelligibility of her utterance “we’re not... counting size” despite the fact that Connor just has classified by size. That is, she presupposes that he understands although his most recent actions have been inconsistent with an earlier and repeatedly reiterated description of allowable and non-allowable actions and explanations for classifying objects (i.e., rules). There is another inner contradiction. Connor has been asked to sort the task according to geometrical properties, even though he does not yet know geometry. In fact, the knowledge (practice) required to do the sorting task is the very knowledge (practice) that the lesson is designed to have as its results. 40In the process of the sorting, Connor’s actions not only accomplish the sorting and resorting of his mystery object, but they also constitute evidence for making attributions about his identity. For example, in contrast to some other students, Connor is asked to reconsider his initial decision and, after a lengthy exchange and articulation of reasons, he ultimately places his object within an existing class labeled “squares, cubes.” Here, the sequence of events and utterances that can be interpreted as “difficulties in understanding” may be used in support of a statement that “Connor has difficulties in mathematics,” “he is not a math wiz,” or that he “has learning disabilities, especially pertaining to mathematics.” In acting, we ex-scribe ourselves and thereby obtain “a being for others” (Hegel, 1806/1977, p. 189 [§316], original emphasis) : the materiality of our actions lends itself to make attributions about our identities, about who we are, about our knowledgeabilities and competencies. These identities are shared, collective possibilities that allow Self and Other to “recognize themselves as mutually recognizing one another” (p. 112 [§184], original emphasis). However, actions that are possible but not yet realized are not captured in this way, for they are not yet seen precisely because the person does not know ; and yet, they have to exist as possibilities otherwise the person (Connor) would not be able to enact this knowledge in the next instant. Who we are generally and who Connor is particularly also is circumscribed by the actions that we could have performed instead because they are already within the range of our possibilities. 41There are further contradictions in traditional ways of theorizing community, identity, and the relation between the two. Communities are not boxes into which individuals are enculturated by moving along a trajectory of legitimate peripheral participation. Individuals constitute communities as much as communities constitute individuals. Whatever any individual does constitutes community in all its diversity : each moment of participation, each action, and each expression is both marginal and central (Roth, Hwang, Lee, & Goulart, 2005). Whereas the constitutive effect of the individual is, in many instances, important in the world outside school, it tends to have little effect on schooling practices. It does matter very little to the mathematics class as a whole whether Connor classifies the object correctly or not, whether he is a math wizard or whether he fails (which may lead, in some countries other than Canada, to repeating the grade). More so, if he is diagnosed with a learning disability-the aleatory nature of which has been well described by others (e.g., Mehan, 1993)-he might be assigned to special classes to be fixed (or to get his disability fixed) rather than be acknowledged for whatever special abilities he might contribute to the community at large. 42Yet another contradiction can be framed as a question : How can students produce and reproduce forms of geometrical knowledge unless they already embody the possibility of acting ? The question is similar to the one that can be asked about the first human speaker ever : How can it make sense to have someone speak unless the very first utterance already presupposes its shared nature ? At the very moment that the children produce and reproduce geometry they also reproduce both Self and Other. The resources available to them-the very patterns of actions that they have evolved from their birth to the moment of finding themselves with others of their age in this classroom-are cultural in nature. The actions they realize are those constitutive of the culture in this classroom, which is only one concrete realization of possibilities of doing geometry in the Anglo-Saxon (Canadian) culture more generally. That is, in the students’ actions, they both realize themselves (their Selfs) and more general, cultural possibilities that inherently are possibilities of the Other as well. 43At its very heart, each individual Self is marked by the Other, expresses itself using a language that is the language of the other, designed for the other, and returning to the other (who thereby has the resources and possibilities for responding in turn). Similarly, that an individual has possibilities that are not yet achieved points us to the heterogeneity of the Self (what I currently exhibit), which already is other than itself (my not-yet-realized action possibilities) in its embodiment of the future-not-yet. Otherness thereby becomes a defining characteristic of Self. 44To me, therefore, the fundamental contradiction is not the one outlined in Situated Learning but the non-self-identity of each, the individual and the community (culture), with itself. It is this claim that I work out in this article. According to Situated Learning, newcomers are caught in the dilemma that “they need to engage in the existing practice, which has developed over time : to understand it, to participate in it, and to become full members of the community in which it exists” (p. 115). In statements such as these, the practice is taken as something self-identical, historically constituted and contingent in nature, but self-identical nevertheless. This becomes the stable framework for the newcomer both in terms of apprenticeship and in terms of evaluating the progress with respect to expertise (as defined by the “core members”). It also allows reading expertise as something that is different along the proposed trajectory from periphery to core-and such differences, because they are continuous, are differences that are indifferent, that is, mean nothing within a dialectical theory (Hegel, 1806/1977). 45Situated Learning continues with stating a second dilemma, whereby newcomers “have a stake in its [community’s] development as they begin to establish their own identity in its future” (p. 115). One of the tasks I set myself is to re-theorize the relationship between individual and collective (“community”), which, even in Situated Learning, can be read as constituting a box (e.g., “careers of newcomers in communities of practice” [p. 115, my emphasis]) into which newcomers enter and that is defined in terms of periphery and center. In particular, from the perspective I outline here, individual and community need to be thought in terms of processes, that is, as in-the-making, and therefore are other than themselves as they embody their own unpredictable developments and future-not-yet. It therefore is not as if newcomers begin to establish their own identity in its future, but this future already is here, in the form of indeterminately unfolding possibilities, constituting the very otherness of community and Self. 46A different concept of action and the associated notion of practice (i.e., a “patterned action”) also is required. Anthropologists and educators frequently take a practice to encompass all that the members of a (sub-) culture can be observed to do, which is associated with the (cultural) artifacts that members employ, deploy, and work on in the process. In this way, agency is entirely described in terms of what is observable. But this does not allow us to observe novelty, on the one hand, and makes us attribute innovation to individuals first observed to do something, on the other hand. This challenges our understanding of understanding : it does not account for how we can understand a form of discourse if it is new and innovative. And if we can understand an innovation it is because it already is encompassed and prefigured in our present collective understanding, as a possibility. There is not just one practice, nor is there simply a multiplicity of (observed, self-identical) practices : there is a multiplicity always-changing and never-self-identical practices. In this case, the notions of actions, agency, and practices need to be expanded to include the future-not-yet in the observed agential possibilities, which exist at the cultural (-historical) level and therefore are inherently shared. Each action not only reproduces culture but also produces it in new ways, even if this may not be perceptible immediately but only cumulatively over years and decades. In language, these two tendencies of reproducing and producing the praxis of speaking are “centripetal forces” and “centrifugal forces,” “processes of centralization and decentralization, of unification and disunification [that] intersect in the utterance” (Bakhtin, 1981, p. 272). With new artifacts available, possible actions change, with new actions in a praxis, the meaning of all others change (singular plural). 47In the previous sections, I provide descriptions of community and identity in a second-grade mathematics classroom. In the context of these descriptions, I articulate why we want to think the two concepts not as things or in terms of states but as processes perpetually suspended between immediate-past and future-not-yet. 48Despite warnings that communities of practice are characteristically different from the collectivities that are assembled into classrooms on administrative grounds rather than grounds that are found within communities themselves, many educators have embraced the term both proactively (for designing learning environments) and theoretically (for describing what happens within the situations observed). Important to me and my present considerations, the very singular way in which the term community of practice is used leads to insurmountable theoretical difficulties. This is so because the notion of practice, if used in the singular (as evident in the image of centripetal force leading to trajectories from periphery to core), inherently differentiates according to an ontology of the same that does not appreciate inherent variations within the practice of interest. With the lack of properly theorizing practice disappears any reason for historical change to occur. The nonhistoric appreciation of individuals and human society characteristic of the medieval era rested precisely on the singularity of meaning. This position came to be exploded during the Renaissance era, which emphasized the ambivalence characteristic of the folk idiom as exemplified in the Gargantua and Pantagruel of Rabelais or the paintings of Hieronymus Bosch and Pieter Breughel the elder (Bakhtin, 1984). 49A simplistic dialectical approach, which theorizes the Other as other than Self-its negative or negation (anti-thesis)-does not assist us in improving much on the concepts of community and identity because it thinks difference in terms of the same11. This approach (abstract is a property abstracted from the concrete) is inverted in a dialectical materialist approach. Here the sensually concrete comes to be an expression of the concrete universal (denoting possibilities) realized in it (Il’enkov, 1982), which brings together the concrete now and the future-not-yet in one and the same phenomenon (concept)12. In Rabelais’ novel, the ambiguity of the past and future-not-yet is concretized in the image of death that simultaneously is birth or in “the vast torrent of praise-abuse, reflecting the contradiction of the world of becoming” (Bakhtin, 1984, p. 419). The double inversion of the traditional (Latin) ecclesiastic litany into a torrent of ambivalent praise-abuse was typical of the vernacular, which thereby became a transformation of culture and society as a whole. The inversion was double because high culture was not simply negated, but, through a positive revalorization came to be a bodily, positive force of transformation in and through the low culture and its vernacular. 50In the same way, rather than thinking of students as being “enculturated” and “acculturated” along a trajectory from the legitimate peripheral participation (here, in this classroom) to-for some of the students perhaps some time in the future-full participation in mathematical (geometrical) practices, I think of these children as constitutive members of culture. Membership constitutes the children as what they are in this classroom. Thus, whereas the authors of Situated Learning view change occurring as “full participants are replaced (directly or indirectly) by newcomers-become-old-timers,” I see change occurring with every act and by every person (newcomer or old-timer) ; and continuity derives from the process of flux, whereby the new already is implicated and present in the old. As such, any “newcomer” already constitutes the mathematical culture generally as what it is, in all its diversity and heterogeneity. Every practitioner, newcomer or old-timer, as every utterance for Bakhtin (1981) utterance, “serves as a point where centrifugal as well as centripetal forces are brought to bear” (p. 272). If we were not to approach the problem in this way, we would not be able to explain how geometry (physics, chemistry) ever got of the ground, immediately imbued with collective sense given the essentially non-geometrical (non-scientific) nature of practices that preceded them. That is, each individual produces culture (even if “only” the vernacular, non-mathematical part) and does not merely reproduce it, as s/he produces and reproduces the very possibilities of culture to act in this and that already possible way. And any non-mathematical way of acting constitutes the very (positive) material, ground, and tool for mathematics to emerge and be transformed. 52Every action-concretely realized or possible-contributes to constituting a practice, which therefore is a singular plural rather than a monolithic entity. Difference comes to be the norm because each action differs from every other action (produced by the “same” or a different individual). If it were not thus, we would not be able to understand or theorize how apparently routine ever – repeating task – where every move appears to be the same as any previous and subsequent move – nevertheless change people so that experts easily can see change that has occurred over longer periods of time (Lee & Roth, 2005). 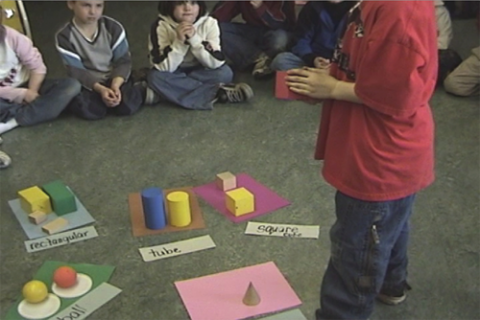 Similarly, the forms of (discursive) actions in this classroom changed over time, even though during the sorting task the teacher frequently repeated the same rules until, in some later session, children no longer sort three-dimensional geometrical objects according to size or color. Change therefore is inherent whether a new “member,” an apprentice, “a” learner, “an” old-timer, or teacher produces an action. Any stable and historically unchanging practice therefore is a construction on the part of the researcher. Any “apprenticeship” and “enculturation” and any addition or loss of member constitutes change. Every concrete realization of an action possibility (both as new agential resources are produced, artifact, image of action) constitutes change and the transformations in the body of the agent. And it is precisely in and through the body of the non-mathematician that mathematics comes to be reborn again and born in new ways. This has radical consequences for thinking individual and community. 54I begin this investigation with the goal of overcoming the aporia inherent in thinking identity and community on the basis of an ontology of the same. For the continuity that is required for identity to exist, we need repetition. But this repetition, this return, is (following Nietzsche) always a renewal, never a return to something that existed before ; the return itself is the phenomenon. This allows us to understand the instability of the self and of identity, which may be the same, but which also may be different, therefore opening up the possibility for change at the very moment of continuity. 55In the entire mathematics lesson generally and in the excerpt involving Connor specifically, the teacher can be understood as having “scaffolded” students so that they classify their mystery objects in a way consistent with classical geometry. Researchers working with sociocultural perspective frequently theorize such teaching–learning situations in terms of the zone of proximal development, where the child (or less able) first comes to participate in a practice on an interpsychological plane prior to reproducing the practice on an intrapsychological plane. In the process, the child becomes like the other, appropriates culture and becomes cultural. Such an explication, however, is fraught with logical contradictions, as Connor’s very participation means that something is happening on an intrapsychological plane. A proper understanding of participation requires us to think in terms of the non-self-identical unity of inner and outer, a unity that is in the first place an outer but “is at the same time taken up into the inner” (Hegel, 1806/1977, p. 189 [§316], my emphasis). Here, I propose a different way of looking at/theorizing such events, beginning with a different ontology based on difference as such. Students such as Connor then are thought of as inherently different from themselves in a number of ways including : (a) using language of, from, and for the Other to express their Selves, which therefore inherently are other and (b) embodying the possibility of the very knowledgeabilities that they do not yet exhibit as such but that are as concrete as the ones that they do exhibit. 56The “community,” too, is non-self-identical because it consists of a plurality of centers (nodes), each singular and therefore different from others. This plurality, in turn, constrains (but does not determine) the individuals that constitute it. The teacher of the one-room school in Moussac-which integrated village and school life one in the other (Roth & Lee, 2006)-perfectly realized what was happening. Confronted by a journalist with the statement that the children in his class do very well without him, Bernard Collot responded : “Not entirely, not entirely. It’s not what they want, but what the collective activity of the class, what the events globally bring about. So what I try is to order these events somewhat.” This global activity comes about in and through the action of individual students, who do not merely do what they want to do, but do what they can do, constrained by the events globally. 57In this article, I use a constraint satisfaction network as a tool for thinking about the relation between individual and collective that puts difference at the heart of Self (individual and collective identity). It is a very simple model to get our thinking started, but it is limited in numerous ways, including the fact that as used, relations between nodes were symmetrical and constant. To arrive at even more powerful models for communities in constant transformation, one would need to open the system to external influences embedded in a system of constitutive systems, allow for the number of members to change, and allow the relational parameters both to be dissymmetric and changeable in time. The system then would be under continuous transformation and steady end states will not (might not) be achieved. Any additional “member” in the network, any additional outside influence, any change in the status of individual members, and any change in the (generally non-symmetrical) relationships between pairs of members influences the trajectory of the system as a whole. 58The view on community and identity that I develop here, which is associated with a temporality internal to the things, is consistent both with recent philosophy that takes into account the dynamics of non-linear systems (Prigogine & Stengers, 1979) and with the philosophy of duration (durée [Bergson, 1907/1969]). Thus, “universe persists. The more we deepen [our understanding of] the nature of time, the more we understand that duration [durée] signifies invention, creation of forms, continuous elaboration of the absolutely new” (p. 11, my translation). 59In closing, I add a word of caution : It would not be good essentializing the constructs introduced here, for métissage (hybridization) that comes with non-self-identity is not something or some thing unless it is already understood both as process and mêlée, a continuous struggle inside and outside of any boundary one might construct. Mixture is not but continually arrives, deriving from a process of mêlée that interbreeds, crossbreeds, weaves, divides, exchanges ; it is something that happens and overcomes us. This, too, is the case for identity, for “if the métis –this métis that each of us is in his/her way– is someone, it is not due to an essence of métissage (a contradictory notion), but is insofar as the métis gives a punctuation, a singular configuration, to the without-essence of the métissage” (Nancy, 1993, p. 12, my translation). In fact, it is in this way for each (theoretical) concept, which is “always dislocating itself because it is never one with itself. It is the same with the thesis which posits and arranges the concepts, the history of concepts, their formation as much as their archivization” (Derrida, 1996, p. 84). 61Grounded in very different philosophical traditions-biblical hermeneutics, phenomenology-other philosophers come to the same conclusions concerning the nature of identity : if there is anything such as the Self, it always and already implicates and implies the other (Franck, 1981 ; Ricœur, 1990). 62In my experience, there is a lot that educational researchers working from sociocultural and cultural-historical perspectives can learn from the thinking and theorizing that scholars in other disciplines have evolved, including recent French philosophy and Bakhtin’s work on language. Questioning one’s own preconceptions generally and one’s ontology more specifically is part of critical inquiry and a questioning of the nature of the concepts we use. Bakhtin, M. (1981). The dialogic imagination. Austin : University of Texas Press. Bakhtin, M. (1984). Rabelais and his world. Bloomington : Indiana University Press. Bakhtin, M. M. (1986). Speech genres and other late essays. Austin : University of Texas Press. Cobb, P., McClain, K., & Gravemeijer, K. (2004). Learning about statistical covariation. Cognition and Instruction, 21, 1–78. Collot, B. (2002). Une école du 3ième type ou “La pédagogie de la mouche.” Paris : L’Harmattan. Derrida, J. (1996). Archive fever : A Freudian impression. Chicago : University of Chicago Press. Franck, D. (1981). Chair et corps : Sur la phénoménologie de Husserl. Paris : Les Éditions de Minuit. Holland, D., Lachicotte, W., Skinner, D., & Cain, C. (1998). Identity and agency in cultural worlds. Cambridge, MA : Harvard University Press. Holland, D., & Lave, J. (Eds.). (2001). History in person : Enduring struggles, contentious practice, intimate identities. Santa Fe, NM : School of American Research Press. Il’enkov, E. (1982). Dialectics of the abstract and the concrete in Marx’s Capital. Moskow : Progress. Lave, J., & Wenger, E. (1991). Situated learning : Legitimate peripheral participation. Cambridge, England : Cambridge University Press. Lee, Y. J., & Roth, W.-M. (2005). The (unlikely) trajectory of learning in a salmon hatchery. Journal of Workplace Learning, 17, 243–254. Mehan, H. (1993). Beneath the skin and between the ears : A case study in the politics of representation. In S. Chaiklin & J. Lave (Eds. ), Understanding practice : Perspectives on activity and context (pp. 241–268). Cambridge, England : Cambridge University Press. Nancy, J.-L. (2000). Being singular plural. Stanford, CA : Stanford University Press. Nancy, J.-L. (2002). Hegel : The restlessness of the negative. Stanford : Stanford University Press. Prigogine, I., & Stengers, I. (1979). La nouvelle alliance : Métamorphose de la science. Paris : Gallimard. Ricœur, P. (1990). Soi-même comme un autre. Paris : Seuil. Roth, W.-M. (2006). A dialectical materialist reading of the sign. Semiotica, 160, 141–171. Roth, W.-M. (2007a). Heeding the unit of analysis. Mind, Culture, and Activity, 14, 143–149. Roth, W.-M. (2007b). Toward a dialectical notion and praxis of scientific literacy. Journal of Curriculum Studies, 39, 377–398. Roth, W.-M., Bowen, G. M., & Masciotra, D. (2002). From thing to sign and ‘natural object’ : Toward a genetic phenomenology of graph interpretation. Science, Technology, & Human Values, 27, 327–356. Roth, W.-M., Hwang, S., Lee, Y-J., & Goulart, M. (2005). Participation, learning, and identity : Dialectical perspectives. Berlin : Lehmanns Media. Roth, W.-M., & Middleton, D. (2006). The making of asymmetries of knowing, identity, and accountability in the sequential organization of graph interpretation. Cultural Studies of Science Education, 1, 11–81. 2 In the modeling of decision-making, I used a fixed and symmetric operator A, that is, the way in which two nodes influence each other is symmetrical and independent of time. In real systems, both of these constraints need to be abandoned to allow for differential institutional power and time-dependence of or temporally changing human relationships (e.g., Roth & Middleton, 2006). 3 This is consistent with recent approaches to understanding concepts and theories: “Let’s suppose a constitutive component is added to a concept: it [concept] probably will break up or undergo a complete change involving, perhaps, another plane [theory], at any rate, other problems” (Deleuze & Guattari, 1991/2005, p. 34–35, my translation). The authors theorize concepts similarly to the way in which I theorize identity and community. 4 English does not distinguish between two forms of activities that are, in the German and Russian of the originators of activity theory, radically different: Tätigkeit (deyatel’nost’) refers to events that are societally motivated formations, whereas Aktivität (aktivnost’) denotes the fact that something is being done. Children in schools engage in tasks, not activity (systems); but they participate in the activity of schooling. 5 Whereas inner contradictions are central to dialectical concepts and processes responsible for the development of the latter, logical contradictions testify to problems in thinking and theorizing (Il’enkov, 1960/1982). 6 In my way of understanding cultural-historical activity theory, there always are two planes, an ideal and a material, and the former is a (non-mirror-like, non-linear, non-causal) reflection in consciousness of the latter. 7 Today, Étienne Wenger (personal communication, September 12, 2007) does no longer adhere to the descriptions provided in Situated Learning but rather has adapted a dynamic view of community and identity compatible with the one I articulate here. 8 In one of the paradoxes ascribed to Zeno, Achilles never catches up with the Tortoise that has a head start of 100 meters, because once the warrior has covered the distance separating him from his competitor, the latter has moved a bit further. Achilles only asymptotically reaches the Turtoise. 9 In a documentary of French elementary school teachers (“Les instits”), Bernard Collot, the former teacher of the one-room school of Moussac, Poitou, said that the teacher’s problem is not learning, for children do learn like they grow their teeth. The teacher just helps here and there in an inherently inevitable process (see also Collot, 2002). 11 Because idealities are taken up by new idealities, “newcomers” to geometry do not have to reproduce the phylogeny of geometry; a corollary is that earlier idealities are not necessarily recoverable at some later time (Husserl, 1939). 12 Throughout Das Kapital (Capital), Karl Marx practices this approach, theorizing the “general” as concrete (collective) possibility at the very heart of the sensually concrete (Il’enkov, 1982). 13 This issue also can be framed different, in terms of the double nature of the object: it appears twice, once on an ideal plane, once on the material plane, both of which simultaneously appear in activity, related in a dialectical fashion (Leont’ev, 1978). Others have made similar statements concerning the subject specifically (“The identity of the concept and singularity is properly the identity of the subject. It is the identity of negativity related to itself twice over: once in the idea, and once in concretion” [Nancy, 2002, p. 56] and for the activity system more generally (Roth, 2007a). 14 The French language allows associating homophonously the verb to come (à venir) with the noun future (avenir). Wolff-Michael Roth, « Identity and Community: Differences at Heart and Futures-to-Come », Éducation et didactique, vol 3 - n°3 | 2009, 99-118.